Last weekend I went nuts cooking. I also realized that with the marathon this weekend, and then likely not wanting to spend my time on my feet in my kitchen when I get back, I decided to go extra nuts, and make enough stuff to freeze for the following week. And I got creative. Partially because I was lazy, but I worked out in my favor. I was going to make more of my Turkey & Butternut Squash Chili, but I only had garbanzo beans, so I decided to make a curry soup. And then I ran out of curry powder, so I ended up going to the grocery store anyway. But, my “soup” became stew, and is delicious, and again, made in a crock-pot so it’s easy to make. It can also be made vegan by adding more beans or vegetables and leaving out the ground turkey. 1) Coat sauté pan with cooking spray, and sauté onions, garlic, 1 tbsp of curry, and turkey until turkey is cooked. 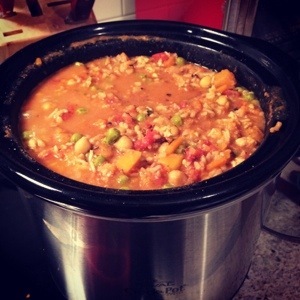 2) Add all ingredients to crock pot, EXCEPT for the rice. 3) Cook for 3 hours on high, stirring occasionally. After 3 hours, add the rice and stir. Cook for another hour. I serve mine with fresh spinach mixed in, and an Ezekiel English muffin. Wait, Ezekiel makes English muffins? I had no idea! Yum. PS. The soup sounds delicious, too! Oh they are amazing! They make the best garlic bread (I cover them with Mrs. Dash Herb& Garlic seasoning and spray with olive oil before putting in the toaster oven). Yum, looks delicious! Thanks for sharing the recipe!